Yeah, that’s right. I “won” Camp NaNoWriMo. That means I wrote 50,000 words during the month of April, toward a brand-new novel. I am on Chapter Seventeen: Trades and Deals, of approximately twenty-seven, which means I am 50,187 words into approximately 70,000-80,000. As a note, I also managed to write more than 15,000 words in the last three days of Camp. Why do I do NaNoWriMo? Two reasons. First, I have 50,000 more words than I would have had otherwise. Sometimes, like last November, that means I have a whole book that didn’t exist before. Big bonus. Second, I consider it a learning experience. So, what did I learn this time around? 1. I can do it. 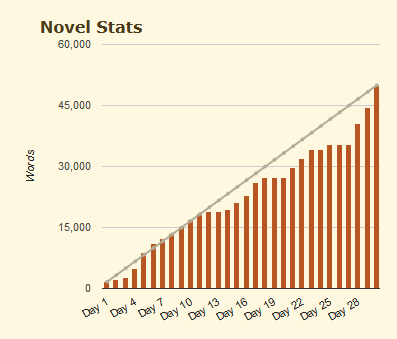 I have only participated in NaNoWriMo once before, November of 2013, and due to a physical injury (and possibly other things), I was unable to write much more than 30,000 words. (For my failing adventures in NaNoWriMo, see here.) Before I tried it the first time, I did not think I was capable of writing 50,000 words in a month. Now, I am sure that I can. In fact, I am convinced I could write even more, if the need arose. See the first lull? That’s just a bad start. Then it’s all good, right? The next lull: that’s a two-day migraine. The next? Easter weekend. Then that last big one? Me telling myself I’ll just take it easy for a few days and hit it real hard at the end. That was basically dumb. Also note, I am a carpool mom, the chef around here, the laundress, the housekeeper, and am active outside of the home. My kids had school projects that needed assistance, I was in a fender-bender, my dad came to town, there was a false claim made against my car insurance, a tornado warning, allergies… Which just tells me, in the words of a friend of mine, I’m a champion. Because this wasn’t easy. It took sacrifice and determination and sacrifice and grit and sacrifice and mental stamina. Champion of the world. 3. I can pull it out at the end. I really hate having to do things this way, but let’s face it, it’s not uncommon for me or anybody else. When the pressure’s on, the gloves come off. 4. I can grow as a writer. I have never written more than around 3,000 words in a day. Thanks to suggestions from fellow campers that some people write a novel in a weekend, averaging more than 10, 15, even 20,000 words per day I smashed that record with a 4,000 word day early in the month. Then I did it again when I hit well over 5,000 on the last day. And, of course, word count isn’t everything. I wrote some pretty great things partly because I approached this Camp as an experiment in the Hero’s Journey. 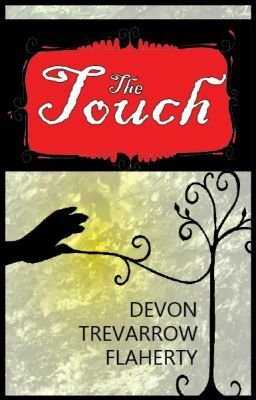 It was out of my comfort zone to write straight-forward fantasy with a fairly care-worn plot, but I believe it strengthened me. I needed stretching in the plot and pacing department. 5. Books can be saved. I guess I always believed this, but took some time this month to solidify this idea. Many writers (not all, but many) just write the first draft. They don’t plan everything out. They don’t dally. They don’t backspace almost as much as they type forward. They don’t re-read everything as they go, making corrections. Generally, I do all those things. But this other philosophy–that once the words are on the page they can be manipulated into something great–is kind of part of my life philosophy. Anything can be redeemed. In this case, it just takes a smart author and a great editor and some time and patience. 6. Perhaps I can make brilliant books without demanding too much of my reader. I forced myself to do two very specific things during Camp: write linearly, and use first person from one perspective only. Oh my! If you have read anything of mine, including the other two books that should be published this September and coming January, I am anything but a linear, one-perspective writer. The Family Elephant’s Jewels is broken down into eight sections which each tell the story from another sibling’s perspective. Benevolent was so riddled with flashbacks that it got labeled a “tapestry.” The Night of One Hundred Thieves has around forty point-of-view characters. Sometimes, doing exactly what you don’t normally do is the best thing for you. It lets you explore whether those other ways of doing things aren’t actually better. In this case, The Journey of Clement Fancywater will demand less from the reader and open my voice up to other audiences. I was afraid I would lose my voice if I changed perspective. In fact, experimentation will most likely strengthen it, over time, and through experience. I know later I am going to kick myself for having forgotten to tell you about some other great lesson I learned during Camp. But let’s just say that I have laundry, dishes, and a usurping ant colony to deal with, and I desperately need to catch that bus out of camp and wave through the dust as I leave it behind. Till next year. Congratulations on your “victory!” And thanks for your little recap. The few lessons you did share are pretty illuminating. I especially like you saying that a book can be linear & limited & brilliant at the same time. I have a BA in Eng Lit, which may be (as some big time novelist once said) the worst major for writers. As such, I have this nagging idea that “good writing” = difficult reading. While this is sometimes true, as a rule, it’s terribly limited my approach to writing. Thank you. And thanks for the comment. I think that sometimes writers end up writing just for other writers, at least in style and scope. I would like to branch out, for more reasons than just the financial. Of course I want to write timeless, beautiful, high-quality literature, but let’s face it: I want to make this a successful business, as well. Great post. Lot’s of great insight. Makes me sad I blew my own Camp time. Packed up and went home early. You are my inspiration for next time. That’s the key. Next time.